India is one of the countries with the largest production of energy from renewable sources. In the electricity sector, renewable energy account for 34.4% of the total installed power capacity. Large hydro installed capacity was 45.29 GW as of 31 March 2018, contributing to 13% of the total power capacity. The remaining renewable energy sources accounted for 20% of the total installed power capacity (71.325 GW) as of 30 June 2018. Wind power capacity was 34,046 MW as of 31 March 2018, making India the fourth-largest wind power producer in the world. The country has a strong manufacturing base in wind power with 20 manufactures of 53 different wind turbine models of international quality up to 3 MW in size with exports to Europe, the United States and other countries. Wind or Solar PV paired with four-hour battery storage systems is already cost competitive, without subsidy, as a source of dispatchable generation compared with new coal and new gas plants in India. The government target of installing 20 GW of solar power by 2022 was achieved four years ahead of schedule in January 2018, through both solar parks as well as roof-top solar panels. India has set a new target of achieving 100 GW of solar power by 2022. Four of the top seven largest solar parks worldwide are in India including the second largest solar park in the world at Kurnool, Andhra Pradesh, with a capacity of 1000 MW. The world's largest solar power plant, Bhadla Solar Park is being constructed in Rajasthan with a capacity of 2255 MW and is expected to be completed by the end of 2018. Biomass power from biomass combustion, biomass gasification and bagasse cogeneration reached 8.3 GW installed capacity as of 31 March 2018. Family type biogas plants reached 3.98 million . Renewable energy in India comes under the purview of the Ministry of New and Renewable Energy (MNRE). India was the first country in the world to set up a ministry of non-conventional energy resources, in the early 1980s. Solar Energy Corporation of India is responsible for the development of solar energy industry in India. Hydroelectricity is administered separately by the Ministry of Power and not included in MNRE targets. India is running one of the largest and most ambitious renewable capacity expansion programs in the world. Newer renewable electricity sources are projected to grow massively by nearer term 2022 targets, including a more than doubling of India's large wind power capacity and an almost 15 fold increase in solar power from April 2016 levels. These targets would place India among the world leaders in renewable energy use and place India at the centre of its "Sunshine Countries" International Solar Alliance project promoting the growth and development of solar power internationally to over 120 countries. India set a target of achieving 40% of its total electricity generation from non-fossil fuel sources by 2030, as stated in its Intended Nationally Determined Contributions statement in the Paris Agreement. A blueprint draft published by Central Electricity Authority projects that 57% of the total electricity capacity will be from renewable sources by 2027. In the 2027 forecasts, India aims to have a renewable energy installed capacity of 275 GW, in addition to 72 GW of hydro-energy, 15 GW of nuclear energy and nearly 100 GW from “other zero emission” sources. The 2022 electrical power targets include achieving 227GW (earlier 175 GW) of energy from renewable sources - nearly 113 GW through solar power, 66 GW from wind power, 10 GW from biomass power, 5GW from small hydro and 31GW from floating solar and offshore wind power. The bidding process for the further additional 115 GW or thereabouts to meet these targets of installed capacity from January 2018 levels will be completed by the end of 2019-2020. The government has announced that no new coal-based capacity addition is required beyond the 50 GW under different stages of construction likely to come online between 2017 and 2022. Unlike most countries, until 2019 India did not count large hydro power towards renewable energy targets as hydropwer was under the older Ministry of Power instead of Ministry of New and Renewable Energy. This system was changed in 2019 and the power from large hydropower plants is since also accounted for. This was done to help the sale of the power from the large Hydropower plants, as this reclassification has made such plants able to sell their power under the Renewable Energy Purchase Obligation. Under the Renewable Energy Purchase Obligation, the DISCOMs (Distribution Company) of the various states have to source a certain percentage of their power from Renewable Energy Sources under two categories Solar and Non-Solar. The power from the large Hydropower plants now classifies under the Non-Solar Renewable Energy Category. * The target is given for "bio-power" which includes biomass power and waste to power generation. The figures above refer to newer and fast developing renewable energy sources and are managed by the Ministry for New and Renewable Energy (MNRE). In addition as of 31 March 2018 India had 45.29 GW of installed large hydro capacity which comes under the ambit of Ministry of Power. The fast growing renewable energy sources under the responsibility of the Ministry for New and Renewable Energy exceeded the installed capacity of large hydro installations. This figure is targeted to reach 175 GW by 2022. Coal power currently represents the largest share of installed capacity at just under 197 GW. Total installed capacity as of 31 May 2016, for grid connected power in India stood at a little under 344 GW. Total renewable energy which includes large hydro with pumped storage generation, is nearly 17.5% of total utility electricity generation in India during the year 2017-18. Solar, wind and run of the river hydro being must run power generation and environment friendly, base load coal fired power is transforming in to load following power generation. In addition, renewable peaking hydro power capacity also caters peak load demand on daily basis. India is the 7th largest producer of hydroelectric power in the world. As of 30 April 2017, India's installed utility-scale hydroelectric capacity was 44,594 MW, or 13.5% of its total utility power generation capacity. Additional smaller hydroelectric power units with a total capacity of 4,380 MW (1.3% of its total utility power generation capacity) have been installed. Small hydropower, defined to be generated at facilities with nameplate capacities up to 25 MW, comes under the ambit of the Ministry of New and Renewable energy (MNRE); whilst large hydro, defined as above 25 MW, comes under the ambit of Ministry of Power. Mean wind speed in India. The development of wind power in India began in the 1990s, and has significantly increased in the last few years. Although a relative newcomer to the wind industry compared with Denmark or the US, domestic policy support for wind power has led India to become the country with the fourth largest installed wind power capacity in the world. As of 30 June 2018 the installed capacity of wind power in India was 34,293 MW, mainly spread across Tamil Nadu (7,269.50 MW), Maharashtra (4,100.40 MW), Gujarat (3,454.30 MW), Rajasthan (2,784.90 MW), Karnataka (2,318.20 MW), Andhra Pradesh (746.20 MW) and Madhya Pradesh (423.40 MW) Wind power accounts for 10% of India's total installed power capacity. India has set an ambitious target to generate 60,000 MW of electricity from wind power by 2022. The Indian Government's Ministry of New and Renewable Energy announced a new wind-solar hybrid policy in May 2018. This means that the same piece of land will be used to house both wind farms and solar panels. 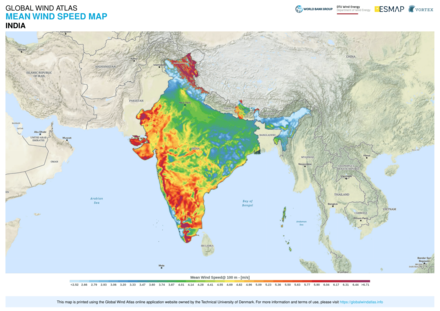 Global Horizontal Irradiance in India. India is densely populated and has high solar insolation, an ideal combination for using solar power in India. Announced in November 2009, the Government of India proposed to launch its Jawaharlal Nehru National Solar Mission under the National Action Plan on Climate Change. The program was inaugurated by former Prime Minister Manmohan Singh on 11 January 2010 with a target of 20GW grid capacity by 2022 as well as 2GW off-grid installations, this target was later increased to 100 GW by the same date under the Narendra Modi government in the 2015 Union budget of India. Achieving this National Solar Mission target would establish India in its ambition to be a global leader in solar power generation. The Mission aims to achieve grid parity (electricity delivered at the same cost and quality as that delivered on the grid) by 2022. The National Solar Mission is also promoted and known by its more colloquial name of "Solar India".The earlier objectives of the mission were to install 1,000 MW of power by 2013 and cover 20×10^6 m2 (220×10^6 sq ft) with collectors by the end of the final phase of the mission in 2022. On 30 November 2015 the Prime Minister of India Narendra Modi and the Prime Minister of France Francois Hollande launched the International Solar Alliance.The ISA is an alliance of 121 solar rich countries lying partially or fully between the Tropic of Cancer and the Tropic of Capricorn, a number of countries outside of this area are also involved with the organisation. The ISA aims to promote and develop solar power amongst its members and has the objective of mobilising $1 trillion of investment by 2030. Much of the country does not have an electrical grid, so one of the first applications of solar power was for water pumping, to begin replacing India's four to five million diesel powered water pumps, each consuming about 3.5 kilowatts, and off-grid lighting. Some large projects have been proposed, and a 35,000 km2 (14,000 sq mi) area of the Thar Desert has been set aside for solar power projects, sufficient to generate 700 to 2,100 gigawatts. Solar power in India has been growing at a rate of 113% yoy and now dropped to around ₹4.34 (6.0¢ US) per kWh, which is around 18% lower than the average price for electricity generated by coal-fired plants. As part of India's ambitious solar programme the central government has set up a US$350 million fund and the Yes Bank will loan US$5 billion to finance solar projects (c. January 2018). India is also the home to the world's first and only 100% solar powered airport, located at Cochin, Kerala. India also has a wholly 100% solar powered railway station in Guwhati, Assam. India's first and the largest floating solar power plant was constructed at Banasura Sagar reservoir in Wayanad, Kerala. The Indian Solar Loan Programme, supported by the United Nations Environment Programme has won the prestigious Energy Globe World award for Sustainability for helping to establish a consumer financing program for solar home power systems. Over the span of three years more than 16,000 solar home systems have been financed through 2,000 bank branches, particularly in rural areas of South India where the electricity grid does not yet extend. Launched in 2003, the Indian Solar Loan Programme was a four-year partnership between UNEP, the UNEP Risoe Centre, and two of India's largest banks, the Canara Bank and Syndicate Bank. India is an ideal environment for Biomass production given its tropical location and abundant sunshine and rains. The countries vast agricultural potential provides huge agro-residues which can be used to meet energy needs, both in heat and power applications..According to IREDA "Biomass is capable of supplementing the coal to the tune of about 260 million tonnes", "saving of about Rs. 250 billion, every year." It is estimated that the potential for biomass energy in India includes 16,000 MW from biomass energy and a further 3,500 MW from bagasse cogeneration. Biomass materials that can be used for power generation include bagasse, rice husk, straw, cotton stalk, coconut shells, soya husk, de-oiled cakes, coffee waste, jute wastes, and groundnut shells and saw dust. In 2018, India has set target to produce 15 million tons (62 mmcmd) of biogas/bio-CNG by installing 5,000 large scale commercial type biogas plants which can produce daily 12.5 tons of bio-CNG by each plant. The rejected organic solids from biogas plants can be used after Torrefaction in the existing coal fired plants to reduce coal consumption. Synthetic methane (SNG) generated using electricity from carbon neutral renewable power or Bio CNG can be used to produce protein rich feed for cattle, poultry and fish economically by cultivating Methylococcus capsulatus bacteria culture with tiny land and water foot print. The carbon dioxide gas produced as by product from these bio protein plants can be recycled in the generation of SNG. Similarly, oxygen gas produced as by product from the electrolysis of water and the methanation process can be consumed in the cultivation of bacteria culture. With these integrated plants, the abundant renewable power potential in India can be converted in to high value food products with out any water pollution or green house gas (GHG) emissions for achieving food security at a faster pace with lesser people deployment in agriculture / animal husbandry sector. Ethanol market penetration reached its highest figure of a 3.3% blend rate in India in 2016. It is produced from sugarcane molasses and partly from grains and can be blended with gasoline. Sugarcane or sugarcane juice may not be used for the production of ethanol in India. The market for biodiesel remains at an early stage in India with the country achieving a minimal blend rate with diesel of 0.001% in 2016. Initially development was focussed on the jatropha (jatropha curcas) plant as the most suitable inedible oilseed for biodiesel production. Development of biodiesel from jatropha has met a number of agronomic and economic restraints and attention is now moving towards other feedstock technologies which utilize used cooking oils, other unusable oil fractions, animal fat and inedible oils. Every year, about 55 million tonnes of municipal solid waste (MSW) and 38 billion litres of sewage are generated in the urban areas of India. In addition, large quantities of solid and liquid wastes are generated by industries. Waste generation in India is expected to increase rapidly in the future. As more people migrate to urban areas and as incomes increase, consumption levels are likely to rise, as are rates of waste generation. It is estimated that the amount of waste generated in India will increase at a per capita rate of approximately 1-1.33% annually. This has significant impacts on the amount of land that is and will be needed for disposal, economic costs of collecting and transporting waste, and the environmental consequences of increased MSW generation levels. ^ a b c d "All India Installed Capacity of Utility Power Stations" (PDF). Retrieved 13 April 2016. ^ a b c "Physical Progress (Achievements)". Ministry of New and Renewable Energy, Govt. of India. Retrieved 18 July 2018. ^ a b c "Press Information Bureau". pib.nic.in. Retrieved 2017-12-27. ^ "Solar and wind now the cheapest power source says Bloomberg NEF". Retrieved 19 November 2018. ^ "Here are India's INDC objectives and how much it will cost". The Indian Express. 2015-10-02. Retrieved 2017-12-27. ^ a b Safi, Michael (2016-12-22). "India plans nearly 60% of electricity capacity from non-fossil fuels by 2027". the Guardian. Retrieved 2018-04-25. ^ "Ministry of New and Renewable Energy, Physical Progress (Achievements)". Archived from the original on 2018-05-03. ^ "renewable energy target now 227 GW, will need $50 billion more in investments, MNRE". ^ a b Govt to set up $350 million fund to finance solar projects, Hindustan Times, 18 Jan 2018. ^ "Ministry of New and Renewable Energy, Annual Report 2015-2016". ^ a b "Ministry of New and Renewable Energy, Physical Progress (Achievements)". Archived from the original on 2018-05-03. ^ a b "Executive Summary Power Sector May 2018" (pdf). report. Central Electricity Authority, Ministry of Power, Govt. of India. 31 May 2018. Retrieved 24 April 2017. ^ "Growth of Electricity Sector in India from 1947-2017" (PDF). CEA. Retrieved 17 February 2018. ^ "Overview of renewable power generation, CEA" (PDF). Retrieved 30 April 2018. ^ "Infographic: Illustrative curve for change in PLF of coal plants". Retrieved 12 December 2018. ^ "Executive summary of Power sector, April 2017" (PDF). Retrieved 25 May 2017. ^ "Renewable Energy Physical Progress as on 31-03-2016". Ministry of New & Renewable Energy, GoI. Retrieved 14 June 2017. ^ "Executive Summary Power Sector February 2017" (pdf). report. Central Electricity Authority, Ministry of Power, Govt. of India. 28 February 2017. Retrieved 24 April 2017. ^ "Small Hydro". Government of India Ministry of New and Renewable Energy. Retrieved 6 April 2019. ^ "Global Wind Atlas". Retrieved 4 December 2018. ^ "Global statistics". Global Wind Energy Council. Retrieved 23 May 2016. ^ "Energy Statistics 2015" (PDF). Central Statistics Office, Govt. of India. Retrieved 23 May 2016. ^ "Executive summary of Power Sector as on 31-03-2016" (PDF). Central Electricity authority, GoI. July 2015. Retrieved 23 May 2016. ^ "Physical Progress (Achievements)" (PDF). Ministry of New and Renewable Energy. Retrieved 23 May 2016. ^ "Does hybrid energy policy make sense for India? Find out". Moneycontrol News. 22 May 2018. Retrieved 22 May 2018. ^ "Wind farm list". Retrieved 2 February 2014. ^ "Muppandal windfarm". Retrieved 2 February 2014. ^ "Jaisalmer windfarm". Retrieved 2 February 2014. ^ "Brahmanvel windfarm (India)". Retrieved 2 February 2014. ^ "Dhalgaon windfarm". Retrieved 2 February 2014. ^ "Chakala windfarm". Retrieved 2 February 2014. ^ "Vankusawade Wind Park windfarm". Retrieved 2 February 2014. ^ "Vaspet windfarm". Retrieved 13 May 2015. ^ "Global Solar Atlas". Retrieved 4 December 2018. ^ a b "Scheme / Documents | Ministry of New and Renewable Energy | Government of India". www.mnre.gov.in. Retrieved 2018-03-19. ^ "Revision of cumulative targets under National Solar Mission from 20,000 MW by 2021-22 to 1,00,000 MW". pib.nic.in. Archived from the original on 2016-10-30. Retrieved 2017-03-27. ^ Sethi, Nitin (18 November 2009). "India targets 1,000mw solar power in 2013". Times of India. ^ "International Solar Alliance, ISA's Journey so far" (PDF). ^ Kenning, Tom (19 October 2016). "India surpasses 1GW rooftop solar with grid parity for most C&I consumers". report. PVTECH. Retrieved 24 April 2017. ^ Dockrill, Peter (20 April 2017). "India surpasses 1GW rooftop solar with grid parity for most C&I consumers". report. scienceAlert. Retrieved 24 April 2017. ^ McGrath, Matt (1 June 2017). "Five effects of a US pull-out from Paris climate deal". BBC. Retrieved 1 June 2017. ^ Crew, Bec (20 August 2015). "India Establishes World's First 100 Percent Solar-Powered Airport". report. scienceAlert. Retrieved 24 April 2017. ^ "India's largest floating solar power plant opens in Kerala - Watt a sight!". The Economic Times. Retrieved 2018-04-14. ^ a b c "Indian Renewable Energy Development Agency Ltd. | Bio Energy". www.ireda.gov.in. Retrieved 2018-03-04. ^ "Compressed biogas to beat petrol and diesel with 30% higher mileage". Retrieved 18 November 2018. ^ "Rs 20,000 crore to be invested in Odisha in bio gas sector". Retrieved 17 December 2018. ^ a b c "USDA Foreign Agricultural Service, GAIN Report" (PDF). ^ Emmanual, William. "Energy Alternatives India". Energy Alternatives India. EAI. Retrieved 5 March 2012. ^ Emmanual, William. "Energy ALternatives India". Energy ALternatives India. Retrieved 5 March 2012. This page was last edited on 19 April 2019, at 17:05 (UTC).